Will Ukraine’s hotheads trigger a new cold war? Like 10 years ago following the “Orange Revolution”, there’s been a dramatic shift in power in Ukraine and a formerly stable political system has collapsed. Unfortunately, this time around events were more tragic, with numerous casualties, bloodshed, and mutual hatred. Now there is hope and romanticism among the victors, who promise not to repeat past mistakes. None the less, independent commentators remain sceptical, fearing that the country could once again follow the same trajectory. Various factors led to the bloody climax in Kiev, including the failure of the Ukrainian political class which, after more than 20 years of independence, has yet to realise its responsibility to the country. The tragedy should serve as a lesson for external players. All too often, neighbouring Russia and the European Union have viewed Ukraine as an object of competition for geopolitical influence. The principal conclusion to be drawn from the turmoil is that Ukraine should never have been forced to choose once and for all between Russia and the West. Ukraine’s heterogeneity creates a situation in which any attempt by the government to side with a particular foreign power leads to a sharp increase in internal tensions. Ukraine’s problems can only be addressed when its largest foreign partners work together. A zero sum game is destructive for a country sandwiched between two large powers. Last week’s convulsions have demonstrated just how polarised Ukrainian society is. The interpretations of events in both Russia and Europe are dangerously black and white, and loaded with ideological clichés. They support the extremist forces on both sides – the extreme nationalists of western Ukraine and the revanchists in the east. A period of stabilisation is needed to reduce the risks. The issue that will soon be at the top of the agenda is the revision of Viktor Yanukovich’s foreign-policy legacy. At the core of that legacy are Ukraine’s non-aligned status and the agreement on deployment of Russia’s Black Sea Fleet in Sevastopol until 2042. The new regime’s desire to eject the fleet as well as to raise once again the issue of Ukraine’s Nato membership, could trigger an extremely negative reaction in Moscow and rekindle geopolitical rivalry. This, in turn, could force Russia to reconsider all possibilities, all the way up to encouraging some provinces to secede. Politicians in Kiev immediately returned to the issue of the association agreement with the EU, which triggered the revolution in the first place. It is clear that politicians in Brussels, Warsaw, and Berlin would like to reverse the failure at the Vilnius summit. But the problems that led to the failure in November have not vanished with the change of government in Kiev. 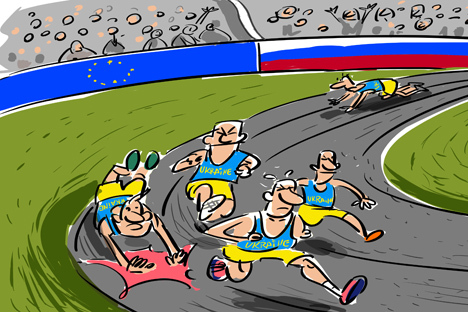 Ukraine’s economic success is possible only if it is able to maintain opportunities in the Russian and European markets. Tripartite consultations and the co-ordination of interests are needed to make this happen. President Vladimir Putin proposed such a course of action last autumn, but the EU wasn’t interested. If last year’s scenario is replayed, the new Ukrainian regime will face even greater challenges from Russian obstruction. A possible attempt by the most militant of the victors to “punish” their opponents, particularly in the east and the south, is another threat. The West is trying to ignore Maidan’s ultra-nationalists, who worship the nationalists of the past that fought on the side of the Nazis. The National Revolution that Maidan is proclaiming has the following items on its agenda: the definition of “anti-national" forces, a ban on ideologies associated with the “accursed past”, lustration (the disqualification of those guilty of past abuses from participating in a new government), and a requirement to swear loyalty not even to the new government, but to a new system of symbols. Such a practice could stoke up major tensions between different parts of the country and provoke a backlash in Russia, to whom the eastern population will appeal. This new page in Ukraine’s history may be similar in content to what happened in Eastern Europe following the demise of the Soviet Union. However, given the size, complexity and specificity of the country, all the pressing problems that faced the post-communist states will be expressed in a more vivid and perverted form. At the beginning of the Nineties there was no great competition for influence (given that Russia had dropped out of the race), whereas now such competition is inevitable. We’ve heard many times since 1989 that the Cold War is over. But time after time events have shown that the inertia of confrontation and rivalry has not disappeared, and that old instincts are very much alive. Ukraine represents a turning point, beyond which there are two possibilities. Either Russia, the United States and the European powers work together to untie the knots of European history, one of which is Ukraine, or a new Cold War will begin in Europe, potentially symbolised by a divided state.